Hallgrimskirkja and Einar Jonsson Museum (Listasafn Einars Jonssonar) will appeal to history buffs. Escape the urban bustle at Kerið and Heidmork Nature Reserve. Change things up with these side-trips from Reykjavik: Keflavik Maritime Center (in Keflavik), Hvalsneskirkja (in Sandgerdi) and Thingvellir National Park (in Thingvellir). There's much more to do: appreciate the extensive heritage of Reykjavik Open Air Museum, see the interesting displays at Lava Centre, head off the coast to Videy Island, and head outdoors with Hekluhestar. To find maps, more things to do, other places to visit, and other tourist information, you can read our Reykjavik day trip site . Syracuse, USA to Reykjavik is an approximately 12.5-hour flight. You can also do a combination of bus and flight; or do a combination of train and flight. The time zone difference moving from Eastern Standard Time to Greenwich Mean Time is 5 hours. When traveling from Syracuse in June, plan for cooler days and little chillier nights in Reykjavik: temperatures range from 55°F by day to 46°F at night. Finish up your sightseeing early on the 28th (Fri) so you can travel to Husavik. Get a sense of the local culture at The Húsavík Whale Museum and Faro de Gardur. Escape the urban bustle at Dettifoss and Krafla Lava Fields. Take a break from Husavik with a short trip to Jokulsargljufur National Park in Asbyrgi, about 44 minutes away. And it doesn't end there: take your sightseeing to a higher altitude at Mt. Namafjall (Namaskard), take in the dramatic scenery at Hverfjall, explore the striking landscape at Rauoanes Point, and get interesting insight from Tours. To plan Husavik vacation without wasting time, ask Inspirock to design an itinerary. You can fly from Reykjavik to Husavik in 2.5 hours. Alternatively, you can do a combination of flight and bus; or drive. In June, plan for daily highs up to 56°F, and evening lows to 44°F. Finish your sightseeing early on the 3rd (Wed) so you can drive to Akureyri. You'll explore the less-touristy side of things at Godafoss and Herring Era Museum. Deepen your sense of the past at sights like Holar Cathedral and Víðimýrarkirkja. You'll find plenty of places to visit near Akureyri: Samgonguminjasafn Skagafjaroar Storageroi (in Hofsos) and Folk Music Center (in Siglufjordur). Saddle up on the 7th (Sun) and explore with a tour on horseback. Spend the 10th (Wed) wandering through the wild on a nature and wildlife tour. And it doesn't end there: see majestic marine mammals with a dolphin and whale watching tour, contemplate the waterfront views at Lake Myvatn, pause for some serene contemplation at Saurbaejarkirkja, and contemplate the long history of Matthiasarhus. For where to stay, maps, traveler tips, and more tourist information, refer to the Akureyri attractions planner. Traveling by car from Husavik to Akureyri takes 1.5 hours. Alternatively, you can take a bus. In July, daytime highs in Akureyri are 57°F, while nighttime lows are 46°F. Wrap up your sightseeing on the 10th (Wed) early enough to travel to Vatnajokull National Park. Vatnajökull National Park is one of three national parks in Iceland. Step off the beaten path and head to Skaftafell National Park and Hofskirkja Church. Get in touch with nature at Svartifoss Waterfall and Vatnajokull. Change things up with these side-trips from Vatnajokull National Park: Jokulsarlon (Jokulsarlon Lagoon & Nature & Wildlife Tours). Next up on the itinerary: kick back and relax at Diamond Beach and pause for some photo ops at Skeioara Bridge Monument. To see other places to visit, where to stay, ratings, and other tourist information, read Vatnajokull National Park driving holiday planner . Explore your travel options from Akureyri to Vatnajokull National Park with the Route module. In July, daily temperatures in Vatnajokull National Park can reach 55°F, while at night they dip to 48°F. Finish your sightseeing early on the 14th (Sun) to allow enough time to take a bus to Kirkjubaejarklaustur. Get in touch with nature at Fjadrargljufur Canyon and Laki Craters. You'll discover tucked-away gems like Skaftarstofa and Ljótipollur. Take a break from Kirkjubaejarklaustur with a short trip to Laugavegur in Landmannalaugar, about 1h 25 min away. To see other places to visit, photos, where to stay, and other tourist information, refer to the Kirkjubaejarklaustur attractions planning tool . Traveling by bus from Vatnajokull National Park to Kirkjubaejarklaustur takes 3 hours. Wrap up your sightseeing on the 17th (Wed) to allow time to drive to Vik. Explore hidden gems such as Reynisfjara Beach and Sólheimajökulll. Step out of the city life by going to Dyrholaey and Fimmvorduhals Hiking Trail. 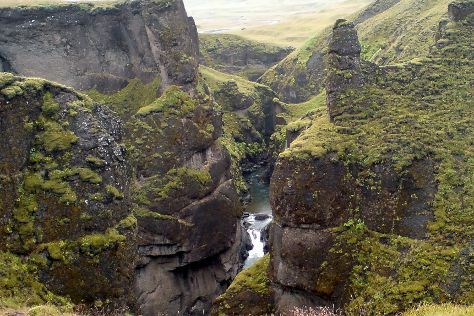 You'll find plenty of places to visit near Vik: Kvernufoss (in Skogar) and Gluggafoss/Merkjarfoss (in Hvolsvollur). 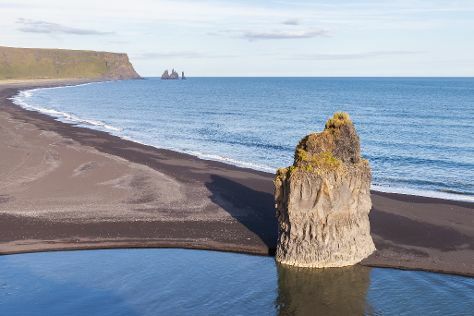 There's lots more to do: take a pleasant ride with a tour on horseback, take in the dramatic scenery at Skogafoss, kick back and relax at Black Sand Beach, and take in the dramatic natural features at Mýrdalsjökull. For maps, more things to do, other places to visit, and other tourist information, read Vik trip planner . Traveling by car from Kirkjubaejarklaustur to Vik takes 1.5 hours. Alternatively, you can take a bus. In July, daytime highs in Vik are 54°F, while nighttime lows are 50°F. Wrap up your sightseeing on the 20th (Sat) to allow time to drive to Blaskogabyggd. Start off your visit on the 21st (Sun): take in the natural beauty of Strokkur, then tee off at Geysir Golf Course, and then admire the sheer force of Gullfoss. To see more things to do, other places to visit, ratings, and other tourist information, read our Blaskogabyggd day trip planner . You can drive from Vik to Blaskogabyggd in 2.5 hours. Another option is to take a bus. Expect a daytime high around 58°F in July, and nighttime lows around 48°F. Cap off your sightseeing on the 21st (Sun) early enough to travel to Isafjordur. Get outdoors at Dynjandi (Fjallfoss) and Hornstrandir Nature Reserve. Satisfy your inner culture vulture at The Old Bookstore and Hversdagssafn - Museum of Everyday Life. When in Isafjordur, make a side trip to see Skruour Botanical gardens in Thingeyri, approximately 32 minutes away. To find more things to do, other places to visit, photos, and other tourist information, use the Isafjordur trip planner . You can do a combination of bus and flight from Blaskogabyggd to Isafjordur in 4.5 hours. Alternatively, you can do a combination of car and bus; or do a combination of bus, flight, and car. While traveling from Blaskogabyggd, expect a bit cooler days and about the same nights in Isafjordur, ranging from highs of 52°F to lows of 47°F. Finish up your sightseeing early on the 24th (Wed) so you can travel to Husafell. Húsafell is a sprawling farm and church estate and the former site of a rectory. On the 25th (Thu), take in the dramatic natural features at Grabrok Crater, then explore and take pictures at Illugastaoir Farm, then sample the tasty concoctions at Brugghus Steoja, and finally explore and take pictures at Haafell Goats and Roses. On the next day, make a splash at Húsafell sundlaug and then take in the dramatic scenery at Hraunfossar. To find more things to do, ratings, photos, and more tourist information, read our Husafell travel planner . Traveling by combination of flight and bus from Isafjordur to Husafell takes 5.5 hours. Alternatively, you can do a combination of car and bus; or do a combination of car and ferry. Traveling from Isafjordur in July, expect nights in Husafell to be about the same, around 48°F, while days are somewhat warmer, around 58°F. Finish your sightseeing early on the 26th (Fri) to allow enough time to drive to Snaefellsbaer. Take a break from the city and head to Snaefellsjokull National Park & Glacier and Dritvik and Djupalonssandur. Get some historical perspective at Budir Church and Olafsvikurkirkja. Change things up with these side-trips from Snaefellsbaer: Grundarfoss Waterfall (in Grundarfjorour), Latrabjarg (Latrabjarg Cliffs & Latrabjarg bird cliffs) and Londrangar (in Hellnar). To find maps, where to stay, ratings, and more tourist information, use the Snaefellsbaer trip app . You can drive from Husafell to Snaefellsbaer in 2.5 hours. Alternatively, you can take a bus. You will have some time to spend on the 31st (Wed) before leaving for home.